New York's historic Garment District—known to many as the Fashion District—still plays a pivotal role in New York's fashion industry. The busy, fashion-forward neighborhood is filled with everything from showrooms and production sites to the Fashion Institute of Technology. Swing by to shop the wholesale fabric shops and sample sales. Find excellent shopping and frequent sample sales in the Garment District, a fashion hub for brands and designers across the globe. 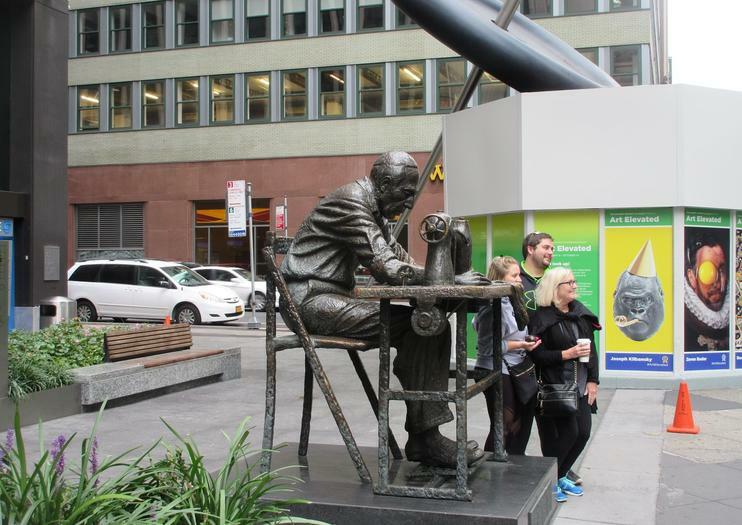 To experience the best of the Garment District, book a neighborhood special access tour. These tours typically explore the Garment District and include stops at wholesale designer showrooms. City sightseeing tours usually stop by the Garment District, and with included transport, they avoid the hassles of navigating the city. Fashionistas and design enthusiasts shouldn't miss the Garment District. The Garment District is packed with notion and textiles shops with supplies for sewing, crocheting, knitting, and quilting. For expert help navigating the neighborhood, visit the Garment District Information Kiosk, at 39th Street and 7th Avenue. Set on New York's West Side, between Fifth and Ninth avenues—from 34th Street to 42nd Street—the Garment District is easy to reach by subway. Take the A, C, 1, 2, or 3 train to 34th Street-Penn Station. You can also take the N, Q, R, or W train to 33rd Street or Times Square-42nd Street. Another option is to hop on the 7 train, crosstown, to Times Square-42nd Street. To shop, plan to arrive to the Garment District during business hours, Monday to Saturday. Expect more foot traffic at evening rush hour, since Penn Station—a bustling transit hub—is nearby. Walking the neighborhood is the best way to explore, so plan to arrive in spring, summer, or fall, since New York winters are notoriously chilly. Visit during Fashion Week for top-notch people-watching; select events are open to the public. A few short blocks from the Garment District, you find the Museum at the Fashion Institute of Technology. Founded in 1969, the museum has a strong industry reputation and hosts numerous exhibitions, including gallery shows curated by FIT graduate students. Find the museum at 7th Avenue and 27th Street. The museum is open Tuesday to Saturday, and closed Sunday and Monday. Bag din billett til kveldsgalaen på Cannes Fashion og Global Short Film Awards, og få din fylle av Fransk Riviera glamour. Black-tie-opplevelsen finner sted under Cannes International Film Festival, og inkluderer moteforestillinger, underholdning, Champagne og middag, samt muligheten til å oppgradere billetten. Velg VIP-alternativet for et bord på forsiden av handlingen med ekstra Champagne, eller velg et privat bord for opptil 10 personer. Vil du oppleve en side av Manhattan som ikke engang lokalbefolkningen ser? Denne 90-minutters tur til New York City er en visuell godbit. Styr multimillion-dollar-treneren, lastet med stadionstil seter, som alle vender mot siden og gir optimal utsikt over byen som aldri sover. Med multimedia som komplement til utsikten, fører trener til attraksjoner som Central Park, Rockefeller Center og Times Square. Lær om historien og kulturen til hvert sted, da den nedslående teknologien tar deg inn i hver attraksjon som aldri før. De vil lære om vesthistorien til Times Square, Herald Square og Chelsea sammen med teaterdistriktet på denne fantastiske turen.